Muslims in Peterborough will soon be able to worship in the city's first purpose-built mosque. After six years' planning, work on the Faizan-e-Madina Mosque on Gladstone Road is now nearing completion. The �2.5m cost has been entirely raised by the local community. Project manager Mohammed Yousaf said: "The community has been here from the late 1950s onwards, and they have been praying in converted detached terraced houses." 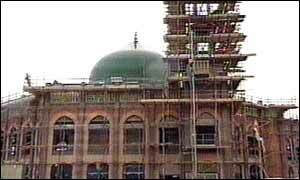 The mosque is now topped by a 30-metre green dome, thought to be one of the biggest in the UK. Up to 1,000 people are expected to worship regularly in the building when it opens. Mr Yousaf said: "This is going to be their first chance to do their prayers in a purpose-built mosque." Mr Yousaf now hopes for a grand opening in the summer, and has invited Prince Charles to attend.